An Iraqi and Kurdish military force of 20,000 – 25,000 troops is being prepared to recapture the city of Mosul from Islamic State fighters this spring. The city was captured by militants last June, and is the largest city in the self-declared caliphate. US Central Command said on Thursday that at the time of this assault, planned for April or May, it will support these troops with airstrikes on enemy positions near Mosul. The city, which has a population of over 1 million, is currently being held by an estimated 1,000 – 2,000 fighters belonging to the Islamic State (IS, also known as ISIS or ISIL). The main forces being assembled for the campaign would include five Iraqi brigades, three smaller brigades acting as a reserve force and an additional three brigades of Kurdish Peshmerga troops. Iraqi security troops would compose the primary attack force during the assault, according to Reuters, while the Kurds will attempt to contain the city from the north and keep it isolated from additional Islamic State fighters to the west. United States Central Command (CENTCOM) has emphasized Iraqi support for the strategy. “They are absolutely committed to this. There are a lot of pieces that have to come together and we want to make sure the conditions are right. But this is their plan. They have bought into it. They are moving forward as if they will execute in the time frame I just described,” an official told Reuters. 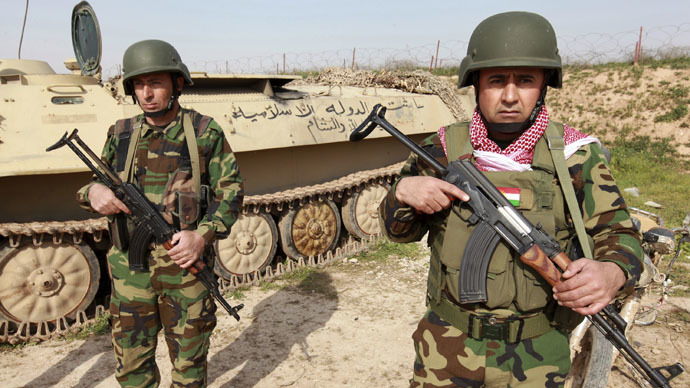 When ISIS first attacked Mosul last June, the Iraqi army simply fled. The Abadi government is confident that the army, together with civilian volunteer fighters from across the country, can win Mosul back over the next few months. If successful, experts say it will be a strategic blow to IS. Abadi said that success would also require close coordination between Iraqi security forces, the US military and the Peshmerga. "We don't want problems in liberating Mosul, or friction in that sense," he told BBC. The 20,000 - 25,000 troops consist mainly of former Mosul police officers and tribal fighters, according Reuters, along with a brigade of counterterrorism troops. The Pentagon has described this as a pivotal battle in the overall campaign against IS in Iraq and it was a reflection of the confidence of Iraq, which devised the battle plan. Since the US-led offensive against the Islamic State began five months ago, Secretary of State John Kerry said that nearly 2,000 airstrikes have helped ground forces retake 700 square kilometers (270 square miles) of territory, kill 50 percent of IS commanders and choking off some of the group’s oil revenue. According to US officials, approximately 6,000 Islamic State members in Iraq and Syria have died since the strikes began.